First National Bank in Cary, North Carolina offers an array of banking services and solutions designed to conveniently serve you. Our dependable team members are ready to assist you with all your banking needs. Visit this branch at 1155 Kildaire Farm Rd or give us a call today at 919-467-7400 to learn more about our full range of commercial banking, consumer banking and wealth management solutions. 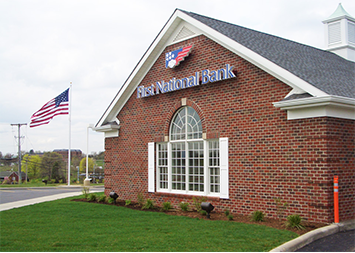 Offering a 24-hour ATM for your banking convenience, this First National Bank branch in Cary, NC is located at 1155 Kildaire Farm Rd. For after-hours banking, you can use our ATM to make deposits, withdraw cash or check your balance. Or, if you need help from one of our friendly team members, please stop in during normal business hours and we will be happy to assist you. First National Bank was founded in 1864, and offers a full range of commercial banking, consumer banking and wealth management solutions. If you are coming from near Cary Academy, head north and turn left onto N Harrison Ave. After 2.7 miles turn left onto Dry Ave. Dry Ave turns right and becomes Kildaire Farm Rd. Arrive at First National Bank (1155 Kildaire Farm Rd, Cary, NC 27511). If you are coming from near Koka Booth Amphitheatre (8003 Regency Pkwy, Cary, NC 27511), head southeast on Regency Pkwy toward Symphony Lake Greenway and turn left to stay on Regency Pkwy. After 0.7 miles turn right onto Tyron Rd. Use the left 2 lanes to turn left onto Kildaire Farm Rd and continue for 1.9 miles. Arrive at First National Bank (1155 Kildaire Farm Rd, Cary, NC 27511). If you are coming from near J.S. Dorton Arena (1025 Blue Ridge Rd, Raleigh, NC 27607), get on I-440 W in Raleigh and keep left to continue on US-1 S. After 2.8 miles use the right lane to take exit 99 for Cary Pkwy. Keep right at the fork to continue toward SE Cary Pkwy. Turn right onto SE Cary Pkwy. Continue for 0.8 miles, turn right onto High Meadow Dr, and then turn right onto Kildaire Farm Rd. Arrive at First National Bank (1155 Kildaire Farm Rd, Cary, NC 27511). If you are coming from near Fred G. Bond Metro Park (801 High House Rd, Cary, NC 27513), head east on High House Rd toward Bond Park Dr and turn right onto NW Maynard Rd. After 2 miles turn right onto Kildaire Farm Rd. Arrive at First National Bank (1155 Kildaire Farm Rd, Cary, NC 27511).